A comfy, warm cardigan is a must-have for the colder winter months. They are easy to throw on whether you are lounging or you need a high quality knit for work. Cardigans are versatile and can be very warm and soft. We have found styles from long to cropped in merino wool, cashmere, or cotton with a few chenille and fleece options thrown in that will keep you cozy and comfortable all winter long. 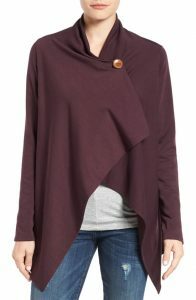 A beautiful, asymmetrical wrap around style that you are going to want to check out is the Bobeau One-Button Fleece Wrap Cardigan. Women love this cardi; it has been around for years and never seems to lose its popularity. It comes in 10 colors and is made from 63% polyester, 33% rayon, 4% spandex. The rayon helps to make it soft, while the polyester is what makes it nice and warm, and the spandex gives it a bit of stretch. 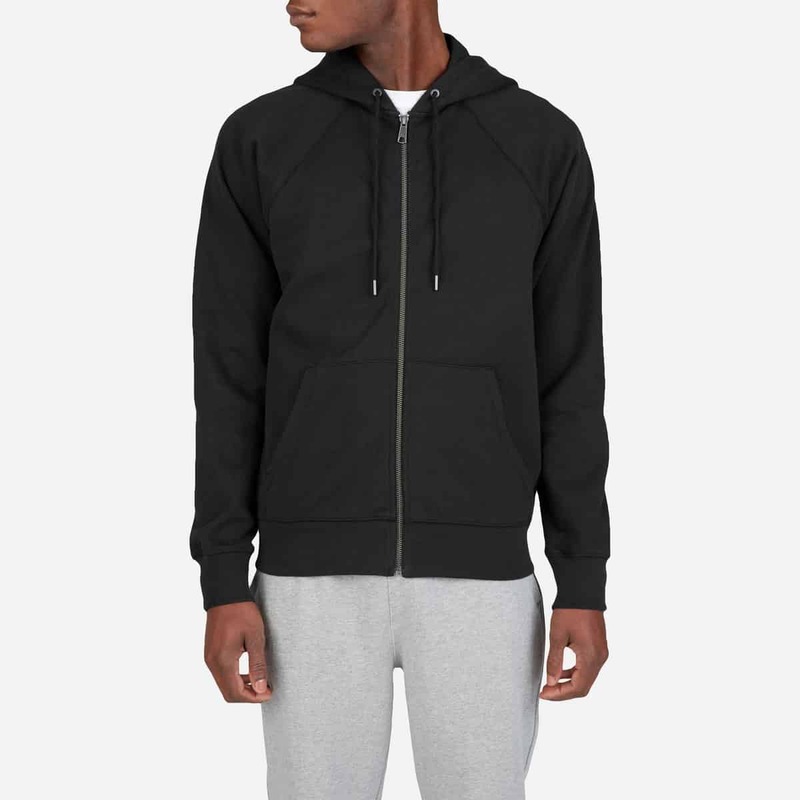 I wouldn’t usually recommend a polyester style, but the fabric is very cozy and avoids feeling uncomfortable like some polyester blends can, it is more of a sweatshirt material than anything. This design looks fantastic with jeans or leggings due to the length, and it is cut in a flattering way in the front and back. The other thing to note about this sweater is that it is super durable and washes and wears well so that it will last for a very long time. L.L. Bean sweaters are usually very warm and come in classic styles. One of their best sweaters is the Double L® Cotton Open Cardigan. It is 100% cotton, which can sometimes be a fabric that is hard to find in a sweater. Since it is cotton, this cardi is easy to wash and care for. Like most L.L Bean products, it is very high quality and well made. Since it is midweight cotton, this style is pretty versatile so that you can wear it most of the year. You shouldn’t have to worry about pilling or the sweater losing shape since it is a fairly tight-knit. Most women will find the Double L® design to be comfortable to wear since it has a relatively loose fit and it is open front, and of course the cotton isn’t scratchy or irritating to wear. You can dress it up or down, and it is a flattering style for pretty much any body type since it has a beautiful drape to it and isn’t super form-fitting. 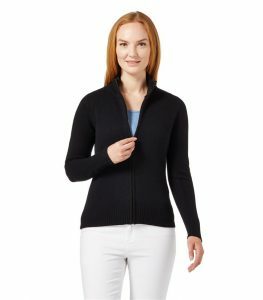 For those women who are fans of comfy to wear styles, you should check out the Lands’ End Women’s. Their designs are made from all kinds of different fantastic fabrics for any comfort loving women, that are soft to the touch and cozy to wear. 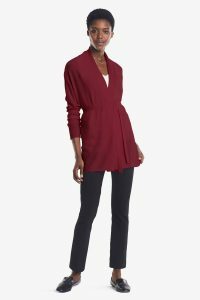 Lands’ End styles are constantly changing with the season, and new beautiful options are coming in all the time giving them a good selection of styles and colors that are usually very warm and quite well made. 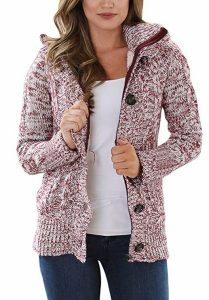 A trendy, inexpensive cardigan or sweater coat that you can easily find on Amazon is the Sidefeel Women Hooded Knit Cardigans Button Cable Sweater Coat. It is more of a jacket than a cardi since it has the faux fur-lining (only the body and the hood are lined not the arms). It looks great and is reportedly very warm and sound quality to boot. It has both a zip and a button up closure down the front. This coatigan has a decent length to it, so depending on the size you get, it may or may not cover your behind. It comes in an excellent range of mostly neutral colors. 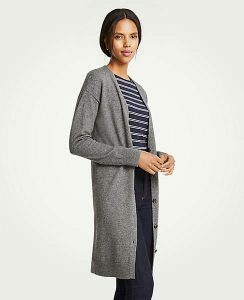 A beautiful, long cardi that is nice and warm to wear in the colder months is the Madewell Kent Cardigan Sweater. Madewell makes some great sweaters that are usually a little more fashion-forward than your basic, classic styles. The Kent, however, is a relatively traditional longline sweater that is perfect for work or lounging. It is often described as feeling like you are wearing a soft, cozy blanket, which sounds great to me. It is made from a nylon blend that has 56% nylon, 30% merino wool, 10% alpaca, and 4% elastane so that it will be warm, and soft with a little bit of stretch to it. You may get some pilling with this design, but if you have a wool comb, you should be able to get rid of that quickly. It is a reasonably long sweater that goes down to some women’s knees, so if you are considering it and aren’t sure about the length, make sure you check it out in store, the sizing also runs pretty big with the Kent. Woolover is an excellent brand if you are looking for 100% natural yarns and blends that are going to feel soft against your skin and that are breathable for extra comfort. The best thing about Woolover styles is that you are getting fantastic quality yarns for very reasonable prices. Their styles are all fairly classic, and they come in a range of colors in fibers like wool, cashmere, and cotton blends. Check out their Coatigans, which are super nice as well. Uniqlo offers some very soft and warm sweaters that are perfect if you work in an office environment. Uniqlo’s prices are always affordable, and the quality is generally pretty good. They are mainly known for their super soft, merino wool designs and their relatively inexpensive 100% cashmere offerings. On some styles, Uniqlo adds a coating to their sweaters to help prevent pilling, so they should be wearable for quite a long time. The sweaters are generally a relatively slim cut, so you may want to size up if you like a looser fit. The popular merino styles come in a vast range of colors and the weight of the merino wool knit is very light, but since it is wool, they tend to be nice and warm. The other things to note about Uniqlo merino wool sweaters is that they aren’t itchy and they are machine washable. 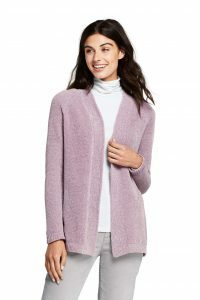 If you are looking for a good quality, dressy cardi that you can wear to work, one of the best places to check out is Ann Taylor. They have beautiful styles that look chic, expensive and that will last well. Ann Taylor is often considered a shop for more mature women, but most styles are good quality options that are great for all ages. 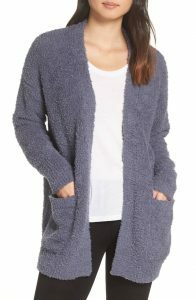 Not only are the cardigans great, but you should also check out the AT coatigans for extra warmth. 100% wool cardigans can be some of the warmest and most durable options when you need a great all around sweater for cold weather. The problem with 100% wool is that some women find it too itchy to wear. 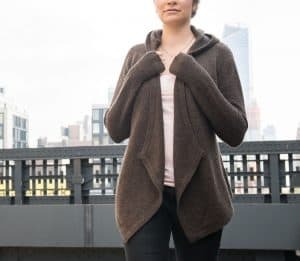 If you are someone who loves wool and doesn’t find it itchy, you may want to have a look at the Betabrand Black Sheep Wrap Sweater. It is made from the wool of the rare black sheep. Despite being from a black sheep, the sweater is more of a gray to brown color; the color can vary slightly on each sweater. The weight of the knit is not very thick, but it is a warm sweater, nonetheless. It has a flowy look to it, but you can button it up as well for a more tailored fit. Since it is wool, some may find it a bit itchy, so you will want to wear long sleeves or a higher collar under this style if you are bothered by 100% wool in any way. 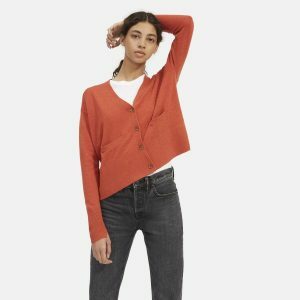 For those who are looking for a more modern, stylish design, check out The Cashmere Square V-Neck Cardigan from Everlane. It is a slightly cropped, boxy fit that is 100% cashmere. Most cashmere options are fairly classic or basic designs, so it is nice to have a more modern option available. This style is a loose fit V-neck with big square pockets. It comes in a couple of primary colors, with the rust color probably being the most appealing. It has beautiful buttons up the front, and the cashmere is high quality and very soft with no itch to it. The only downside to this sweater is that it is dry clean only. For the woman on the go who has no time for shopping, you are going to want to check out MM LaFleur. You can order items from their site or use one of their stylist to curate the ideal work wardrobe for you. Once the stylist figures out what are good clothing items for your taste and lifestyle, they send them to you, and you keep what you want and send the rest back. If you aren’t interested in using their stylist service, you can order directly on their site. They sell two cardis that are both beautiful and well worth a look. First up is the Daphne, that is known for being both flattering for all body types, and for being super soft since it is made of a lightweight cashmere. The other cardi that is very popular is the Morandi 2.0 Sweater. It is gorgeous, cozy and practical since it is made from super soft merino wool. A lot of women consider this design the perfect desk sweater. The only downside to MM Lafleur is that they are relatively pricey. Barefoot Dreams make some fantastic cardigans, but most of their best ones are lightweight and not meant for severe, cold weather. One style that they do make that is great for cold winter nights when you are snuggling up on the couch, is the CozyChic® Cardigan. It is an oversized style, designed for those who love to lounge. If you are looking for cozy, soft, and warm, this sweater can’t be beaten. You can wear it out with a casual outfit, but it isn’t dressy and is designed as a lounging sweater for wearing home. 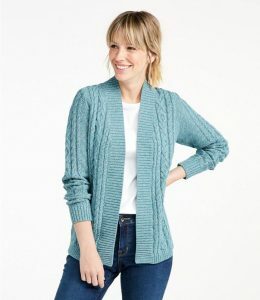 Finding the perfect cardigan involves figuring out what fabric types you like, and finding the perfect color and fit. Fabrics– For the softest styles look for merino wool, cashmere, or cotton blends. There are some excellent polyester blends they are available, but be careful about what they are blended with. Look for blends with other fabrics that are known for being soft like rayon (in some cases) or cotton. Warmth– The warmest styles are usually made from wool or cashmere. If you go for a 100% wool sweater, there is a good chance that it will be itchy, except for merino wool that is known for its warmth and softness. Cashmere is also known for being warm, soft and lightweight, making it an excellent option for work as it doesn’t come with the added bulk that wool does. Cotton doesn’t tend to be as warm as other fabrics, but it is usually relatively soft and can often be worn for most of the year. Washable– Getting a sweater that is either machine or hand washable is much easier than dry clean only sweaters. Unfortunately, many of the higher end cashmere styles are the softest and coziest styles, but they also have to be dry cleaned, which can be a pain and add extra cost. If this is an issue for you, make sure you check before you buy. Sizing– If you like a generous fit, as a lot of women do with their sweaters, you can always size up or look at men’s designs.